Article: "Law and Neuroscience: Possibilities for Prosecutors"
"Law and Neuroscience: Possibilities for Prosecutors"
Very good food for thought regarding the need for progress in applied psychological measurement. Double click on image to enlarge. I just uploaded the following PPT presentation to my SlideShare account---IQ Score Interpretation in Atkins MR/ID Death Penalty Cases: The Good, Bad and the Ugly. It was presented this month (Sept, 2012) at the Habeas Assistance Training Seminar. Click here to view. Professor Deborah Denno of Fordham University Law School has published an article in the Michigan State Law Review concerning her research into the use of genetic evidence possibly related to behavior characteristics in criminal cases. Denno found that the primary use of this evidence was in death penalty cases at the penalty phase, and that it is almost always used as mitigation evidence. The article notes some of the dangers in this kind of evidence based on past use. Nevertheless, the author concludes that courts are accepting of this evidence, even though it does not determine the outcome of the case. (D. Denno, "Courts' Increasing Consideration of Behavioral Genetics Evidence in Criminal Cases: Results of a Longitudinal Study," 2011 Michigan State Law Review 967; posted Aug. 22, 2012). See Law Reviews and Studies. Article: LAW REVIEWS: "A Modest Proposal: The Aged of Death Row Should Be Deemed Too Old to Execute"
LAW REVIEWS: "A Modest Proposal: The Aged of Death Row Should Be Deemed Too Old to Execute"
Article: "Meaningless Opportunities: Graham v. Florida’s 'Meaningful Opportunity for Release' for Juvenile Offenders and the Reality of De Facto LWOP Sentences"
"Meaningless Opportunities: Graham v. Florida's 'Meaningful Opportunity for Release' for Juvenile Offenders and the Reality of De Facto LWOP Sentences"
Thanks again to Kevin Foley for sending me two new recent Atkins decisions. Decisions are posted without comment. Hooks v Workman (OK,2012). Prior 2005 decision can be found here. A new study in Science finds judges tend to give lighter sentences to violent, psychopathic criminal defendants when presented with evidence that the defendants had a gene linked to aggressive behavior. Researchers at the University of Utah — including former CLB Fellow Teneille Brown — provided judges with a fictional case file that described a violent crime. All of the case files identified the defendant as a psychopath, but half included additional scientific evidence linking the defendant's pyschopathy to a genetic cause. Although judges appear inclined to give substantially longer sentences to defendants identified as psychopaths, the study found those sentences were an average of a full year shorter when judges heard biological explanations for the defendant's behavior. If you can't get past the paywall at Science to read this fascinating study, you can learn more in news coverage by the New York Times and NPR's Morning Edition, among other outlets. While rehabilitation is reemerging as an important penological goal, the Supreme Court is eroding the long-revered divide between capital and non-capital sentences. This raises the question of whether and how rehabilitation applies in the capital context. Courts and scholars have long concluded that it does not — that death is completely irrelevant to rehabilitation. Yet, historically, the death penalty in this country has been imposed in large part to induce the rehabilitation of offenders' characters. Additionally, there are tales of the worst offenders transforming their characters when they are facing death, and several legal doctrines are based on the idea that death spurs rehabilitation. Courts' and scholars' conclusion that death is irrelevant to rehabilitation likely stems from changes in our understanding of rehabilitation. While it was once understood as referring to an offender's character transformation, references to rehabilitation now often focus on offenders' direct impacts on society. This has the effect, though, of distracting from the humanness of the worst offenders and consequently not providing them with true opportunities to transform their characters — a denial which challenges the Eighth Amendment's focus on respecting the human dignity of the condemned. Another side to this story. I have not reviewed the IQ testing and thus won't make any comments either way. A Texas death row inmate scheduled to die later Tuesday for the killing of a police informant 20 years ago is hoping the U.S. Supreme Court agrees with his attorneys that he's too mentally impaired to qualify for execution. Marvin Wilson, 54, was found to have a 61 IQ on a 2004 test, putting him below the generally accepted minimum competency standard of 70, his attorneys contend in an appeal before the justices. Five I.Q. scores are reflected in those reports. The first I.Q. test, the Lorge-Thorndike, was administered by Wilson's school when he was approximately 13 years old. Wilson's full-scale score on this test was 73. At age 29, Wilson was given an I.Q. test by the Texas Department of Criminal Justice and scored 75. In April 2006, when Wilson was 46 and during the post-conviction proceedings, Wilson scored 61 on the WAIS III I.Q. test. On further testing by the defense, Wilson scored 75 on the Raven Standard Progressive Matrices and 79 on the TONI-II I.Q. tests. A score of 70 or below supports a finding of mental retardation. There are five tests, four of which show Wilson is not retarded. The one outlier is the one that gets prominent mention in the AP story. The state court's opinion quotes extensively from the state's cross-examination of Wilson's expert Dr. Trahan, challenging Dr. Trahan's reliance on his assumption that the WAIS-III was administered by a "well-respected and well-trained psychologist" when in fact the test was given by an intern and Dr. Trahan conceded that no records were available to indicate Wilson's motivation, attentiveness or cooperativeness or the test surroundings. Wow. That really should be sanctionable misconduct for a scientific professional. Failure to take appropriate measures to determine whether the subject in malingering in a context where he has a powerful incentive to malinger is not science, it is prostitution. 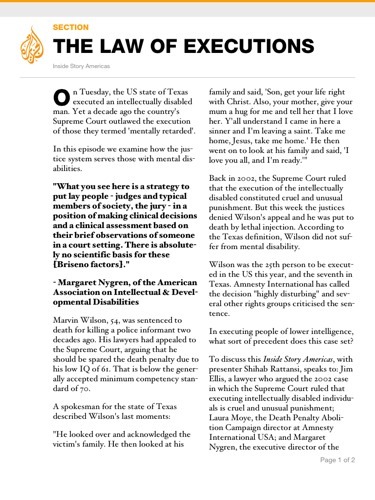 If 54-year-old Marvin Wilson is put to death on Tuesday, it will not be because Texas denies that he is intellectually disabled, or as the legal literature puts it, "mentally retarded." This much, the state recognizes. 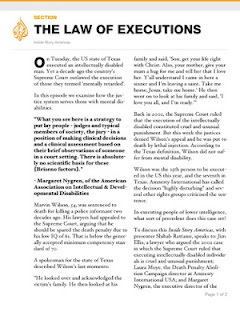 It just does not believe that Wilson is disabled enough not to be executed in Texas--a flagrant violation of the 2002 Supreme Court ruling in Atkins v. Virginia, which held that "the mentally retarded should be categorically excluded from execution," period. That is simply a bald-faced lie. The state very much denies that Wilson is "mentally retarded." The defendant has the duty and burden to demonstrate by a preponderance of the evidence that he is mentally retarded. While there is some evidence to support that conclusion, the overwhelming weight of the credible evidence indicates that he is not. Why are all these stories uncritically reporting what Wilson's lawyers say when the contrary holdings of two courts are easily available? It would be easy to ascribe this to ideological bias, but I think that is too simplistic. There are likely three factors at work here. Ideological bias is one of them. A second is "big story" bias. The execution of a clearly guilty murderer who claims to be retarded, but in fact is not, is not a big story. That is an inconvenient truth when your job is writing about big stories. A third is just plain laziness. The anti-death-penalty movement spoon-feeds the press. The pro side doesn't. The lawyers actually working on the case are government attorneys who typically don't actively seek out the press. Some won't even talk to the press when asked. Organizations on the pro side (including CJLF) are small and sparsely funded. We can't launch PR operations on every case. When these three factors converge, the press coverage becomes profoundly distorted. All is not lost, though. Rodger Jones at the Dallas Morning News reads the claims with appropriate skepticism. At SCOTUS, the docket for Wilson's certiorari petition is here, and the stay petition is here.